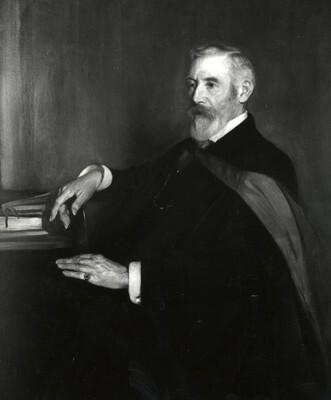 George Gilbert Ramsay (1839-1921) was Professor of Humanity at the University of Glasgow from 1863 to 1906 and (in his eighties) was Dean of Faculties from 1919 until 1921. Born in France, Ramsay studied at Trinity College, Oxford and graduated with a First Class both in Classical Moderations and in the Final Classical School. He was an assistant to his uncle William Ramsay before succeeding him in the chair at Glasgow, and is said to have presided over the largest classes at the University. He wrote a number of Latin text books. Ramsay was a keen climber, a member of the Alpine Club in London, and the president at the meeting in 1889 at which the Scottish Mountaineering Club was established. He was the Club's first President. Born 19 July 1839, Fontainebleau, France.